In the past year or so, Max has started tolerating being out of the house, and into nature a lot more. This means, that after almost 8 years, we are able to get back to doing some of the things that made us first fall in love with Colorado. Through the years, I've bookmarked sites that were wheelchair accesible, in hopes that one day Max would want to get out with us. Now that he's up for it, we're trying to check some out! 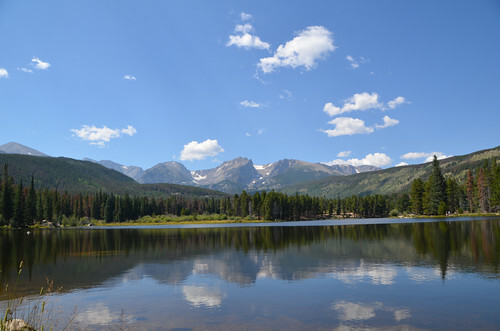 This weekend, we went to Rocky Mountain National Park, and went for a lovely hike around Sprague Lake. It was absolutely beautiful. We even got to see a family of black bears running through the trees!!!! A few of my friends have asked for my list of sites that are accessible, so I thought I could share here. Very detailed, from level of difficulty to maneuver a wheelchair to how many accessible parking spots there are. Another guide from Boulder.gov to accessibility in and around Boulder. Rocky Mountain National Park accessible trails. We found Sprague Lake very accessible. There were a few bumpy places in the trail, but nothing extreme, and we just steered around those spots. There was shade when we needed it, and plenty of cool breezes. The Disabled Traveler's Companion - Rocky Mountain National Park. A webpage with detailed information on camping, hiking, lodging, attractions, etc. at RMNP. Estes Park Accessibility site. Outlining the mountain town outside of Rocky Mountain National Park. Great Sand Dunes. This is somewhere we really want to get to with Max! They have special wheelchairs to be able to go up on the dunes with wheelchair users! Eldorado Canyon State Park, near Boulder with several options for scenic trails. Max loves to hear the rushing water here, and on a Fall day, it can't be beat for beauty! America The Beautiful Pass is the lifetime pass for persons with permanent disabilities. We picked up Max's pass a couple of weeks ago upon entering RMNP. It is Max's pass, so he must always be in the vehicle for it to be used, but that's not too difficult, since he's always with us! Columbine Pass - park pass for $14 for disabled Colorado Residents that lets you into state parks for a year. Wilderness on Wheels is another site we are wanting to go with Max, about 60 miles SW of Denver, in Grant, CO. It has a raised boardwalk to experience the outdoors up close, with hiking, fishing, and camping. Our regular daytime trains are wheelchair accessible! It's only our enclosed cars - that we run nights and after about mid-October - that are not. Please give us a call at 1-888-456-6777 for more information or to reserve space. Thank you so much for your interest in the Wild Animal Sanctuary! We are wheelchair accessible, the only place he will not be able to access is the wolf deck on top of the welcome center because those have stairs going up. He will get to see plenty of animals! We have extended our walkway, so he will get a great look of the animals. Let me know if you have any further questions! Handicap Accessible yurt in Golden Gate State Park, here's an account of Max's buddy Cici and her family trying that campsite out. This book, Access Anything: Colorado, Adventuring with Disabilities (2005, Fulcrum Publishing), has so many wonderful resources too! 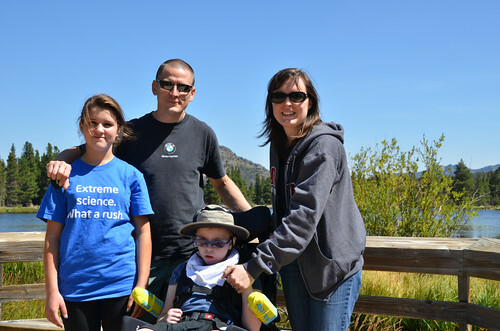 By following that link, you will find resources to accessible camps and travel tips as well as information on the book. These are just the links I've saved. I'll have to hunt it down and re-order it. If you know of more sites, please leave a comment and let me add it to my list! Looks like so much fun. Do you mind if I share your list on the adaptions blog? To answer your question Junior is using the switch interface from Ablenet with his ipad but the school is ordering him the RJ Cooper one also(the able net one isn't working for all apps). Thanks for the tip on the interface, we'll look into it. He's doing better with his dynavox, but still prefers to "play" on his ipad!